Mo is standing in the perfect spot for the show. It’s about 20 feet back from the stage, the little elevated area next to the guard rail. A clear view over the crowd and a quick swivel to get to the bar. It’s far enough from the speakers that it’s not overwhelming, but close enough that it feels like you’re in the band’s living room. With the bands that play here, it probably IS their living room. She’s patiently waiting for the show to start. Except they tore the bar down in 2004. Long Wong’s was the perfect dive bar. It was a little place on a corner of Mill Avenue in downtown Tempe. You could stand outside and look in the big picture window behind the band. Or you could pay the five bucks and battle the crowd. It’s where the Gin Blossoms started out, and we spent countless nights there watching them, the Refreshments, Dead Hot and the other bands part of the “Tempe Sound” that became a thing for a few years. Robin, the Blossoms singer, played acoustic on Wednesdays. Elvis the Cat sold his little collages. The buffalo wings were unspeakably hot and the beer was cheap. We loved that place. Stiflingly hot in the summer, freezing in the winter. The way music should be. It was home. The company they were leasing from decided to close it to build a Fancy Building there. The last show was April 3, 2004. The building was razed soon thereafter. 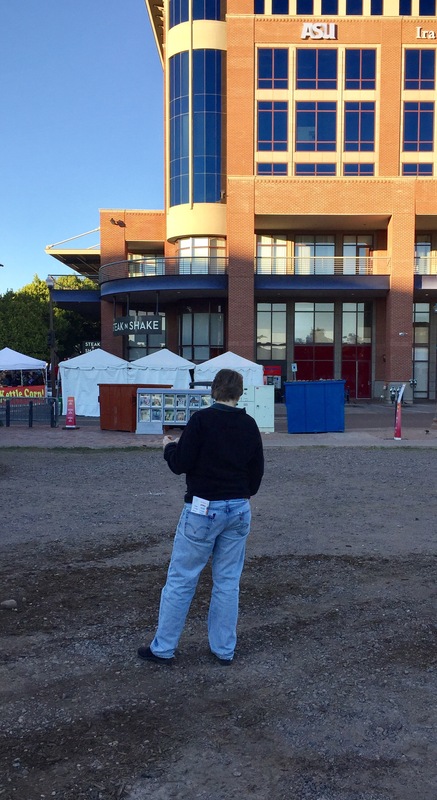 A gravel lot stood as a symbolic graveyard of live music in Tempe. We went back today, not quite 13 years later. And it’s still a gravel lot. I don’t know business, but I know music. And standing there in our usual spot, waiting for the show to start, I lament that commerce always wins over art. Artists move into downtown Phoenix because it’s a blighted ghost town. The art brings in visitors, which causes stores and cafes to pop up, and causes condos to be built. So they kick out the artists to build new businesses, and we’re left with a shiny hipster heaven with no heart. The artists move elsewhere and the cycle repeats itself. I guess there’s nothing much to be done about it. Artists and musicians have passion, not money. You just seek them out while they’re there, cling to that guard rail with your Rolling Rock in hand, and know that nothing lasts forever. And then you savor the memory, standing in a gravel lot, watching the imaginary stage and waiting for “Hey Jealousy” to break out one more time. This entry was posted in margarine and tagged arizona, art, life, music. Bookmark the permalink.